Or what are collective intelligence assemblies and why are they the game we must learn to play so we can play the game? “Better together” increasingly goes the mantra when the conversation turns to solving big problems whose characteristics combine complexity and scale with intensity and intransigence. Shifting models and practice of school education from the ground up, finding better and more affordable ways to connect health and social care, making our cities more liveable or working out how to adapt to, perhaps even to avoid, catastrophic climate change. You know the sort of thing. It’s not hard to add to the list…shifting thick patterns of working to accommodate the rise of the robots and the ambiguous march of artificial intelligence, lifting the trust quotient of large public, corporate and civic institutions that are increasingly out of shape and out of place in a connected world of speed, intensity and subversive legibility. I’m not sure when it was ever a good idea to try to solve these kinds of problems by relying on simple or singular responses. It certainly isn’t now. The answers, if there are any, are going to come from our capacity to think, imagine and act together in more and more interesting and often unusual combinations of skill, experience, knowledge, decision-making and delivery. In other words, our capacity for collective intelligence. It’s the same problem again – we’re not short of intelligence, we’re just short of good ways to line that intelligence up to larger collective outcomes. So even if it’s true that we’re “better together”, it turns out that getting together is harder than it looks. 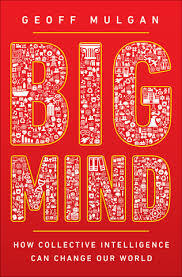 Big Mind, Geoff Mulgan’s new book, is the culmination of 20 years of thinking, advising, designing and delivering on the front line of activism, policy and public work in the UK and around the world. He argues from the early part of the book that “the ways intelligence is organized are largely fractal in nature with similar patterns occurring on multiple scales, from groups of friends to organizations and whole societies.” If you remember from your complexity theory, “fractal” means that the shape and patterns of organising are the same at whatever scale you observe the phenomenon you are studying. Think sea shells, snowflakes, lightning, broccoli, peacocks and pineapples. There’s an important clue in that description to one of the consistent themes of Geoff’s work more broadly. The ‘dynamism” of collective intelligence relies on a “mechanism” of large institutions together with looser, and usually digitally mediated networks of knowledge and practice, to actually do the work. And that work is always the same – concentrated, hard and often unspectacular thinking and analysis, communication and diffusion, alignment through incentive structures (which are often either unhelpful to the common cause or positively antagonistic to it) and delivery. But there’s a problem, obviously. Collective intelligence works best when it activates all three loops and levels, each of which is triggered when the opportunity or risk we’re trying to tackle demands that other, larger and higher parts of the system become engaged. Hands up anyone whose organisation has a tendency to “end up much more collectively stupid than they could be”? I thought so. Geoff’s first academic and research interests were focused on communication and networks, so it’s not surprising he makes (appropriately) much of the role of the Internet itself. The book, in line with Geoff’s more recent writing for Nesta on his collective intelligence ideas (here and here) gets more interesting when he describes how “collective intelligence assemblies” are created. That makes intuitive sense. What we’re trying to do is render the pieces – knowledge, expertise, physical and virtual assets, platforms, money, policy, power and authority – more intelligent as they assemble themselves in something that starts to look like a purposeful and decisive puzzle. Yet, he continues, “some of the most important fields—including politics, the university, and finance—lack this capacity for iterative shuffling, and so become locked into configurations that keep them less effective than they should be.” This is crucial. As I argued in a small book a few years ago written with former Finance Minister Lindsay Tanner, institutions too often find themselves out of shape for the new roles of collective intelligence (as Geoff offers the framework) to which we want them to contribute. As Lindsay and I argued, “changing shape” is an institutional reform imperative that now looms larger than ever. Geoff’s focus is as global as it is ferociously and predictably local. At the global level, he suggests, “there is a need for new assemblies that can marshal global collective intelligence for global tasks, from addressing climate change to avoiding pandemics, solving problems of unemployment to the challenges of aging.” He think it’s possible to imagine what these could look like—building on recent initiatives in medicine and the environment that try to observe, model, predict, and act. The spread of Google Maps is a good example. It started off with a grand ambition of organizing global geographic knowledge in a comprehensive and usable form. But Google lacked many of the crucial skills to achieve its ambition and so brought in—or to be more precise, bought in—others: Where 2 Technologies, a company founded by two Danish brothers, which provided a searchable, scrollable, and zoomable map; Keyhole, which developed the geospatial visualization software that would become Google Earth; and ZipDash, which provided real-time traffic analysis, based on information gathered anonymously from cell phone users. This assembly of different elements supplied the spine for a truly global system of geographic knowledge. Next Google had to tap into a much wider set of skills to make the maps more useful. It did that by opening up the software—through the Google Maps API—to make it as easy as possible for other sites to integrate it. Some of the most interesting hybrid assemblies use platforms to aggregate and orchestrate ingenuity on ever-larger scales. Makerbot Thingiverse is a platform that hosts over 650,000 designs for the maker movement. WikiHouse shares elements of design for anyone to design their own house—encouraging users to put their own adaptations and ideas back into the commons. In health, a new family of platforms allows people suffering from acute conditions to become collective researchers, turning a disparate group of patients into something more like a collective intelligence by using a mix of digital and human thought. Current examples have recruited people with Parkinson’s disease and supplied them with wearable devices with accelerometers so that they can pool data about how they were faring, and a similar approach has been applied to dementia. One of the most comprehensive existing collective intelligence assemblies quietly supports cancer treatment in England’s National Health Service through the National Cancer Registration and Analysis Service. Despite the mundane name, this is an extraordinary feat of organization that points to how many public services and whole systems could be run in the future. It links thousands of records—including the three hundred thousand new cases of cancer in England each year. It brings together diagnoses, scans, images, and past treatments. The data feed into predictive tools to help patients choose different treatment options. Where necessary, the data are linked to genetic information, or other data sets that help to predict if the illness could lead to debt or depression, and market research information to help better target public health messages. The whole array of information is then used to guide the day-to-day decisions of doctors and increasingly patients too. And many of us will know why that deceptively simple invitation is, well, deceptively simple. For example, “within any group, diverging and conflicting interests make any kind of collective intelligence both a tool for cooperation and a site for competition, deception, and manipulation.” Collaboration, Geoff reminds us, can cut both ways and is not necessarily a “good” in its own right. It is a way of getting work done. The question is, what is the work? Similarly, collective intelligence can find itself strung out between “the silence of the old hierarchies in which no one dared to challenge or warn, and the noisy cacophony of a world of networks flooded by an infinity of voices.” Too much silence or too much noise will kill the instinct to assemble and use multiple intelligences. As always, the (necessarily experimental) search is for the sweet spot, recognising that the spot keeps moving and only reveals itself as a function of persistent search, learning and action. It is precisely to experiment with new ways to fill that gap – the gap left by the absence of groups or process that “see it as their role” to do this kind of purposeful connecting and intelligence-directing – that The Impact Assembly, a new venture from PwC’s social impact practice has been established. I am working with the Assembly (at least we picked the right word!) to find effective ways to ‘assemble’ disparate pieces of collective action puzzles into useful and disciplined collaboration. Current pieces of work are happening in domains as diverse as obesity, mental health and suicide prevention, young people and the new work order, multiple sclerosis and homelessness. Geoff is right. The stakes could not be higher. It is, in that sense, the ultimate enabler and, for that reason, a rising target for innovation and invention in its own right. Social innovations are new solutions (products, services, models, markets, processes etc.) that simultaneously meet a social need (more effectively than existing solutions) and lead to new or improved capabilities and relationships and better use of assets and resources. In other words, social innovations are both good for society and enhance society’s capacity to act. Like social innovation in this definition, you get the strong sense from the book that collective intelligence has the same dual meaning – getting problems solved or at least tacked productively and, as a consequence, building the capacity to solve future problems. Like all good habits, I guess, collective intelligence gets more useful (for the problems you want to solve in the future) the more you use it (to solve the problem you’re trying to solve now). In a way, I suppose, the idea of collective intelligence could be just a fancy way of reminding ourselves that, in whatever group we find ourselves – a family, an organisation, a city, a country or the globe – we’re almost always more than the sum of our parts. There is often a wisdom in the crowd, a way and strength of knowing and acting that gains immeasurably from its social or networked provenance. And in a world grown too big to know, as David Weinberger so elegantly put it, the smartest person in the room is very often the room. Geoff’s collective intelligence thesis is all about how we design tools, cultures and assets that turn what the room knows into purposeful and productive action. In that sense, collective intelligence points to the shifting nature of the kind of knowledge we need to survive and thrive in a world in which speed, intensity and a kind of radical connectedness renders the business of turning knowing into useful acting irreducibly collective. This is a book that needs a bit of time to study and ponder. I keep going back to chunks of the argument and share the narrative with colleagues and clients alike. As always with a Mulgan book, there is plenty to challenge and provoke. The book is not the answer, or even an answer, but it does have answers that test and stretch. It draws on more than 20 years of intense study and practice to offer some sharp, difficult but very valuable questions. The American writer Thomas Berger one said, apparently, that the art and science of asking questions is the source of all knowledge (he also, even more pithily, answered the question “why do writers write” with the obvious answer, “because it isn’t there.”; not strictly relevant here but a profound insight worth sharing). If knowledge and questions go together, Big Mind is full of knowledge we can usefully engage, test, use and perhaps even add to. I wonder what Mr. Mulgan would make of the work of Mary Parker Follett, whose 1924 work “Creative Experience” was perhaps a precursor (and something we can still learn a great deal from?) Follett was the originator of the term “power-with” (contrasted with “power-over”), and in her 1918 work “The New State”, the aforementioned book “Creative Experience”, and in the posthumous collection known as Dynamic Administration, very much focused on the yet-undeveloped but needed capacity for collective intelligence in all arenas, from neighborhoods to political systems to business. All of Follett’s works are digitally available at http://mpfollett.ning.com.